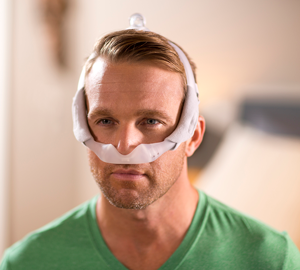 The DreamWear Nasal CPAP Mask with Headgear - Fit Pack (All Cushions Included with Medium Frame) by Philips Respironics is an innovative mask that uses a tubelike frame to deliver airflow directly to the nasal cushion. 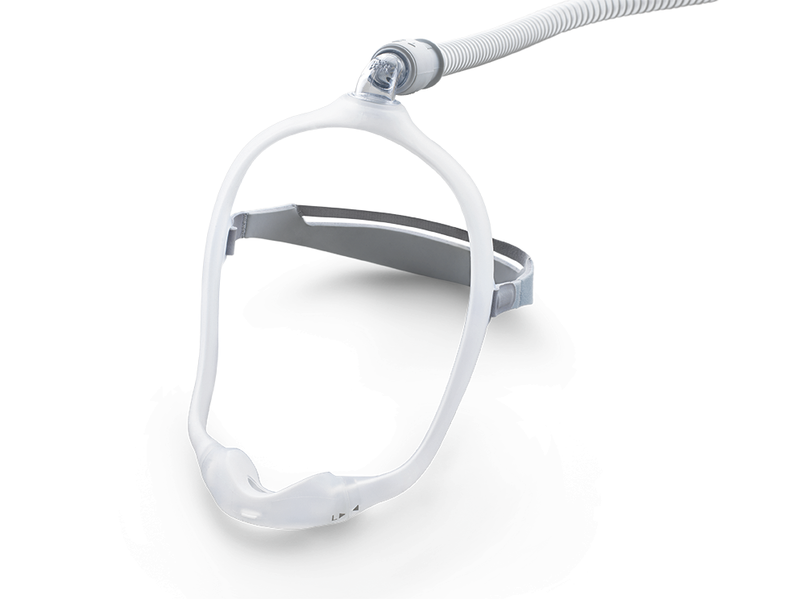 The CPAP hose connects at the top of the head allowing for a minimalistic design that limits contact with the face. This Fit Pack includes all sizes of nasal cushion and the medium frame which will fit most users. 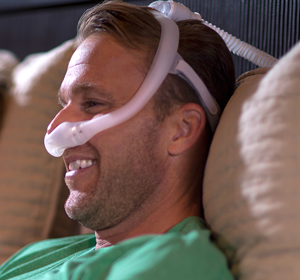 The DreamWear CPAP Mask frame is designed to allow airflow to pass through it to reach the nasal cushion. 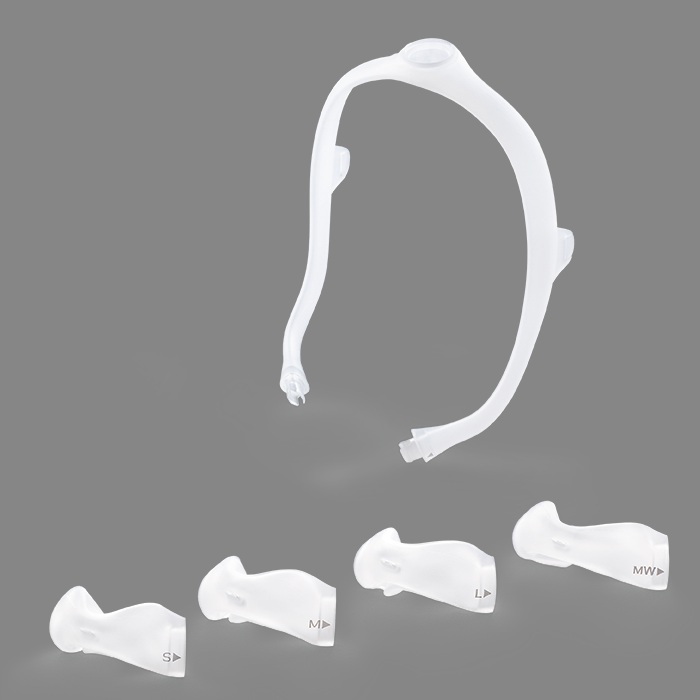 The frame is a single piece with connections for the hose elbow, headgear, and nasal cushion. If one side of the frame is closed by being laid on, the airflow can pass entirely through the other side without negatively affecting therapy pressure. The medium frame is included with this fit pack, but is available in other sizes for separate purchase if needed. The DreamWear frames and cushions are interchangeable, so any size frame will fit any size cushion. I have used a few different masks over the years, but this dreamwear nasal mask is the best of all of them. It is so comfortable, and with no annoying air leaks based upon sleeping position. I would highly recommend this to everyone. I'm sorry to say this mask did not work for me. It leaked and kept on waking me up. I honestly don't like it like I thought I would. The mask cut me under my nose. The mask leaks and you can hear it at night. This mask is comfortable, but it comes off during my sleep. How can I keep it on? You may need a smaller frame (generally medium, but we are finding small works on a larger number than anticipated). The other suggestion is to make sure when laying down that the part where the tube connects is on the top of your head. If it is not located on the top of the head it can slip forward or backwards. I have mixed feelings about my purchase. At 1st I was really excited when I received my mask. It was light weight, it was easy to take off and on. I sleep on my side and it leaks a lot and the noise of the leakage wakes me up. It needs built in nasal pieces to stop the leakage.Also the headband does not fit securely and rides up. I would give this a D-. I am going back to the basic nasal pillows. How do I get my money back? Just got my "Dream Weaver" so I haven't had a a of use yet. But. Can tell you the following, it's the most comfortable device I have every used. I have tried two types of full masks and one nasal pillow. The masks where the worst, the pillows actually protruded in the nostril and all we unpleasant.